﻿ Free duplicate analyzer for ACT! Free Duplicate Analyzer for ACT! How to use Duplicate Analyzer? 1. On installing, Duplicate Analyzer adds a menu "DupChecker" in ACT!™ with three entries. Click "Generate Duplicate Analysis Report (free)" to initiate the free scan. 2. 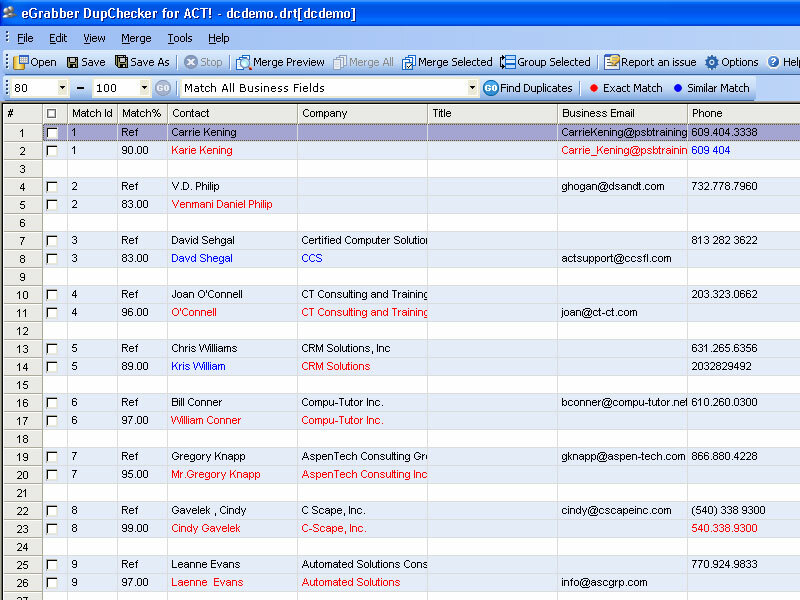 The free scan processes your entire ACT!™ Database and generates a report on number of duplicates detected, number of duplicates by match field such as Name/Company match, Email match, Phone match and Address match. 3. A partial list of Duplicates detected is shown in the DupChecker grid, giving you full flexibility to merge those duplicates. To view the complete list of duplicates and to merge/purge them from your database, you need to purchase eGrabber DupChecker. Judge the quality of your database. Estimate your business effects caused due to duplicates. Implement mechanisms to eliminate the duplicates. Analyze the cause of duplicates in your organization and employ methods to fix them. Duplicate Analyzer is a free tool that finds duplicates in any ACT! database. To view the complete list of duplicates and to merge/purge the duplicates, you need to purchase eGrabber DupChecker for ACT! Web Download: 15 MB during installation.